PRINCE-LEE Isidore appeased the home fans with an entertaining and commanding win by unanimous decision over Venezuela's Antoni Armas in their highly-anticipated ten-round WBF lightweight title match at the Woodbrook Youth Facility on Saturday. After a slow start, Isidore stormed back into the bout with his deft movement and measured punches, which left the audience and judges without question as to the rightful winner. The Venezuelan was resilient and caused some early scares in the TT corner, but he was distinctly second best against his shorter opponent. "My performance could've been better," said the 32-year-old, whose record now stands at 16 wins, one draw and three losses. "I thought I could have fought better. Because of the delayed start, I did (get) cold," Isidore added, alluding to the 15 minutes it took for his opponent to emerge out of the locker room and into the ring. Isidore lost his footing in the first round and collected several heavy hits to the body in the second, perhaps Armas' spell of the match. The local fan-favourite, however, quickly compensated in the third round and took nearly complete control by the fifth. Isidore was in such control by the eighth period that he began to vary his strikes against a visibly tired Armas, adding entertainment value for the appreciative crowd. The intense title match and second fixture of the five-match card offered some consolation to fans, many of whom were audibly upset by the several delays over the course of the programme. There was cause for major concern in the opening bout between Joel "Matador" McRae and Nigel "Cow" Edwards, after both fighters nearly fell out of the ring during a partial collapse of the structure that left another delay in the programme, which had already started approximately 90 minutes later than advertised. McRae and Edwards were against the ropes when a turn buckle snapped, according to an official, causing the ropes to drop. While unfortunate, the irony of the incident was glaring. 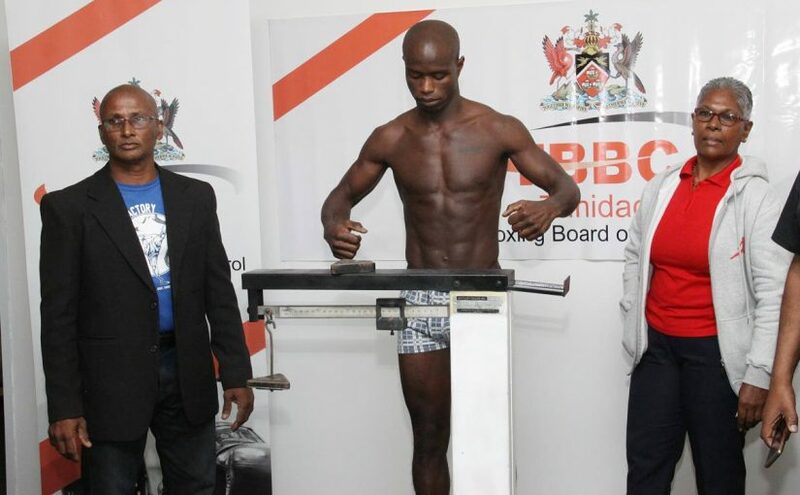 TBBC officials, who gave clearance for Saturday's professional card, recently denied the TT Boxing Association (TTBA) a permit to host an amateur card at the Youth Training Centre because of a rip in the canvas of another ring. However, the official who said the ring's partial collapse on Saturday was caused by a snapped turn buckle, also said the incident was unavoidable and could not be blamed on the Trinidad Boxing Board of Control (TBBC), which sanctioned the event. After a nearly 20 minute intermission, officials cleared the ring and allowed the match to continue. In the end, McRae, the heavier of the two boxers by 23lbs, won by a majority decision after six rounds. In the other bouts, US-born Carlos Sanchez, who represented TT at the 2012 Olympic Games, secured a win by split-decision over Dallan Llovera of Venezuela, while veteran heavyweight Kertson Manswell responded to Kenneth Bishop's rhetoric leading up to their fight with a win by unanimous decision. Kevin Diaz also won by unanimous decision in his match against Iwan Azore. The event was hosted by Fine Line Promotions and US-based Lion Stone Boxing Promotions. The post Prince reigns in Woodbrook appeared first on Trinidad and Tobago Newsday.